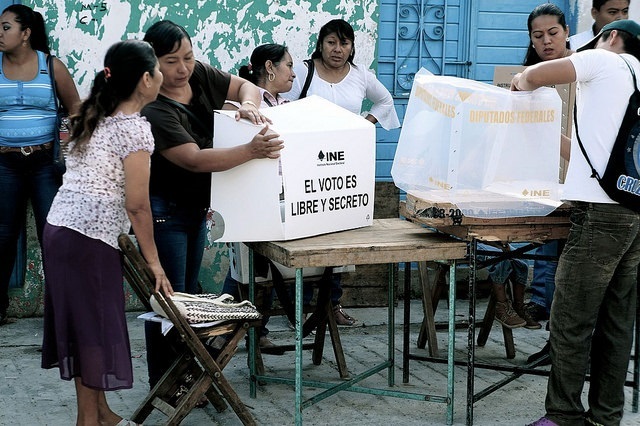 Mexico’s mid-term elections last Sunday to select governors, mayors, and local and federal legislators confirmed popular engagement in the democratic process, but deep frustration with the country’s political parties. Voter turnout – 47 percent of eligible voters cast ballots – was high despite violence, isolated ballot-burnings, attacks on election board offices, and calls for boycotts. The elections were carried out under highly adverse conditions. Some 1,400 murders were recorded nationwide in April – the highest rate in a year – and a clash between privately supported vigilantes and suspected cartel members left 13 dead in Guerrero state the day before voting. Four assassinated candidates remained on Sunday’s ballots (and at least one won). Pre-election polls showed that some 90 percent of citizens distrusted the political parties, and over half expressed disapproval for President Peña Nieto half-way into his six-year term. According to press reports, voters were motivated by concern about the government’s inability to deal with the resurgence of violence or even satisfactorily explain massacres, such as the disappearance last September of 43 students who were last seen in police custody. Mexico’s sluggish economy may have driven people to the polls as well; the government cut growth estimates in May because of lower than expected oil revenues and U.S. growth. El Bronco can legitimately claim to embody rejection of the traditional parties, and in that respect his rise to prominence is not unlike that of many charismatic politicians in Latin America’s recent and not-so-recent past. Given his campaign’s lack of programmatic clarity, it is not clear that he or the votes cast in his favor represent anything more than that. 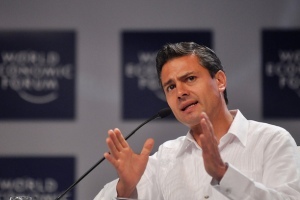 President Peña Nieto achieved important reforms during his first three years in office, particularly in energy and education, but these have neither generated enthusiastic support nor their anticipated benefits. Whether the President has any new compelling ideas to offer for the remainder of his term remains to be seen. The relatively high turnout last Sunday despite popular cynicism toward the parties and myriad security challenges does testify to Mexicans’ resilient democratic aspirations, but the election also reflects widespread public disillusion with the available options – incumbent as well as opposition. The ruling PRI failed to offer (or even project) a credible agenda for Mexico during what are clearly times of trouble, and the country suffers from a lack of coherent alternative visions for either conservative modernization (the PAN) or progressive transformation (PRD or its former standard-bearer, Andrés Manuel López Obrador, with his newly established Morena party). Across the ideological spectrum, Mexico’s politics are stuck, and it’s going to take more than one Bronco to drive out the dinosaurs. According to OECD education data, just 45 percent of Mexican students complete their secondary education, though the rate has improved over the last decade. Mexico spends 3.7 percent of GDP on primary and secondary learning, — less than Chile, Argentina, and Brazil but in line with the OECD average. Experts believe that Mexico’s educational problems are largely political, not budgetary. A full 97 percent of spending goes to salaries, feeding a teachers’ union that has a history of patronage and graft. The problem has deep roots in the clientelistic structure through which the old PRI governed during its 70 years in power before losing in 2000 – and with which the PAN governments coexisted for 12 years. The storyline shares certain similarities with PRI President Carlos Salinas’ sacking of the head of oil workers’ union in the 1990s, presaging limited reforms in that sector. 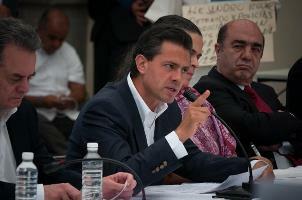 Peña Nieto probably intends the removal of the most visible representative of old-style patronage politics as a clear signal that the PRI will not bring back the bad old ways – despite the possible appearance of the firing and arrest being driven by revenge – but the reform legislation is widely seen as a positive step forward. Rhetorically at least, the major parties have agreed to a multi-pronged effort for more reforms in the “Pact of Mexico.” However, forging consensus on further reforms will be more difficult, as entrenched PRI politicians at the local level are already resisting many of the president’s proposals. The PAN and PRD are already criticizing Peña Nieto for being too cozy with media barons and for handling telecommunications reform behind closed doors. 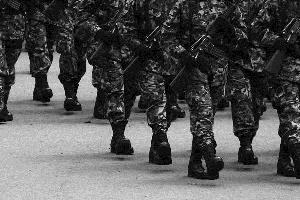 Security policies and proposed energy reforms are more contentious still. Reforming other sectors will require going after harder targets than Gordillo and will pose greater tests of Peña Nieto’s ability to win votes in the Mexican Congress.